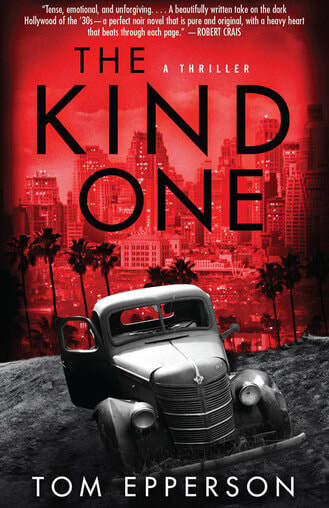 "...Set amid a world of 1930s L.A gangsters, screenwriter Tom Epperson’s debut novel, The Kind One, is suspenseful noir in the vein of Raymond Chandler and James Ellroy." "Tense, emotional, and unforgiving, Tom Epperson's THE KIND ONE is a beautifully written take on the dark Hollywood of the 30's--a perfect noir novel that is pure and original, with a heavy heart that beats through each page." Finding Tom Epperson’s work was a lesson in humility for me. It was a Saturday morning in early February. The Fault Tree had been on the shelves for a total of three weeks and I was knee-deep in a book tour and signing events. I’d arrived at Mysteries to Die For in Thousand Oaks, California a bit early for the event. With Southern California traffic, you can never tell whether you’ll be an hour early or an hour late for an event so you build in a little cushion. Ridley Scott will produce period noir drama "The Kind One" for Warner Bros. Casey Affleck is attached to star in the film, which is based on a novel by Tom Epperson, who will pen the screenplay. Story, set in 1930s Los Angeles, centers on an amnesiac who finds himself working for a mobster -- a killer given the nickname "the Kind One" -- and falling in love with the thug's girlfriend. Scott and Jules Daly are producing for Scott Free; Ideaology's Sean Bailey ("Gone Baby Gone") is also producing. "It's a world that Ridley has never touched before, so that's what drew him to the project," said Daly, who worked with Affleck when she produced "The Assassination of Jesse James by the Coward Robert Ford." Scott's "Body of Lies," starring Leonardo DiCaprio and Russell Crowe, is scheduled to be released by Warners in the fall. Screenwriter Tom Epperson is living his dream. Now he's written a well-received L.A. crime novel. Tom Epperson, a longtime Hollywood screenwriter and even more longtime aspiring novelist, is a gentle man who's just published a brutal book. Epperson, who has a shy Arkansas twang and a slight hangdog manner, was talking on a recent afternoon about his 1930s-esque noir, "The Kind One," at Musso & Frank's in Hollywood, a place he loves for its literary ghosts. Casey Affleck is attached to star in period noir drama "The Kind One," based on the just-published novel by Tom Epperson. Film will reunite Affleck with "Gone Baby Gone" producer Sean Bailey, who is producing through his new Disney-based Idealogy shingle. Story, set in the 1930s Los Angeles, centers on an amnesiac (Affleck) who finds himself working for a mobster -- a sadistic killer given the nickname "the Kind One" - and falling in love with the thug's girlfriend. Epperson will adapt his novel when the WGA strike is over. Last year saw Affleck star in "Gone Baby Gone," and he had a supporting turn in "The Assassination of Jesse James by the Coward Robert Ford," receiving an Oscar nomination for the latter. Epperson frequent collaborates with his boyhood friend Billy Bob Thornton. They co wrote the screenplays for "One False Move," "A Family Thing" and "The Gift." "The Kind One,"which marks his literary debut, was published Jan. 22 by Five Star. And the main characters, though based on recognizable crime novel prototypes, are larger than their origins: Their passions and habits, their pasts and their quirks, are unique, so much so that the tight plot becomes secondary to the characters themselves. Epperson is the screenwriter (with Billy Bob Thornton) of such thrillers as “One False Move,” “The Gift” and “A Family Thing,” so it’s no surprise that “The Kind One” reads as if he wrote with a movie in mind. To be sure, it could be a fine film, but the novel itself is of the highest caliber in its genre and makes the leap into literature, as do the best works in all genres. Eric Miles Williamson is the author of the novels “Two Up” and “East Bay Grease,” and the forthcoming nonfiction book, “Oakland, Jack London, and Me.” He teaches English in the Rio Grande Valley at the University of Texas-Pan American. Screenwriter Epperson (coauthor of the script for One False Move) makes an effortless transition to novel writing with this hard-biting noir set in 1930s Los Angeles. While the contours of the plot will strike many as familiar, the author avoids clichés in his tale of Danny Landon, who works for vicious mobster Bud Seitz (aka “the Kind One”). Danny, who suffers from amnesia, only dimly recalls the events that led to his receiving the epithet “Two Gun Danny,” but finds the accounts he’s been given of his violent past at odds with his current revulsion for bloodshed. When Seitz, a mercurial figure with a hair-trigger temper, asks Landon to keep an eye on his current squeeze, Darla, the two men soon find themselves in conflict. With spare prose, Epperson presents Landon’s inner turmoil plausibly and manages to throw in an occasional turn of phrase that Raymond Chandler might have penned. ...It’s an impressive debut and deserves to be followed by more.